Actinosynnema mirum Hasegawa et al. 1978 is the type species of the genus, and is of phylogenetic interest because of its central phylogenetic location in the Actinosynnemataceae, a rapidly growing family within the actinobacterial suborder Pseudonocardineae. A. mirum is characterized by its motile spores borne on synnemata and as a producer of nocardicin antibiotics. It is capable of growing aerobically and under a moderate CO2 atmosphere. The strain is a Gram-positive, aerial and substrate mycelium producing bacterium, originally isolated from a grass blade collected from the Raritan River, New Jersey. Here we describe the features of this organism, together with the complete genome sequence and annotation. 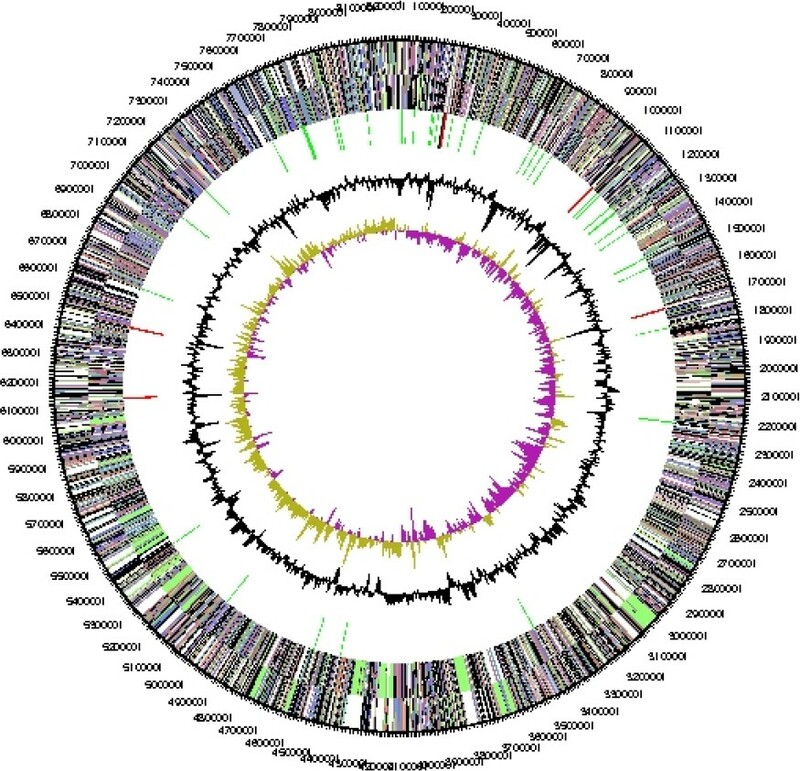 This is the first complete genome sequence of a member of the family Actinosynnemataceae, and only the second sequence from the actinobacterial suborder Pseudonocardineae. The 8,248,144 bp long single replicon genome with its 7100 protein-coding and 77 RNA genes is part of the Genomic Encyclopedia of Bacteria and Archaea project. Strain 101T (DSM 43827 = ATCC 29888 = NBRC 14064, and other culture collections) is the type strain of Actinosynnema mirum, which is the type species of the genus Actinosynnema  (Figure 1). A. mirum was described by Hasegawa et al. in 1978  as an aerobic actinobacterium which forms synnemata (compacted groups of erect hyphae which bear conidia) with zoospores . The organism is of interest due to its position in the tree of life where the small genus Actino-synnema, currently comprising only two species, is located on a rather long branch within the rapidly growing actinobacterial suborder Pseudo-nocardineae . We here present a summary classification and a set of features for A. mirum strain 101T (Table 1), together with the description of the complete genomic sequencing and annotation. Phylogenetic tree highlighting the position of A. mirum 101T relative to all type strains of the genus and to the type strains of the type species of all other genera within the family. The tree was inferred from 1,491 aligned characters [5,6] of the 16S rRNA gene sequence under the maximum likelihood criterion  and rooted in accordance with current actinobacterial taxonomy. The branches are scaled in terms of the expected number of substitutions per site. Numbers above branches are support values from 1,000 bootstrap replicates if larger than 60%. Lineages with a type strain genome-sequencing project registered in GOLD  are printed in blue; published genomes in bold. No closely related cultivated strains are known from the literature that can be linked to the species A. mirum. Curiously, the 16S rRNA gene sequences of the type strains from the two subspecies within the second species of the genus Actinosynnema, A. pretiosum subsp. auranticum (AB303364) and A. pretiosum subsp. pretiosum (AB303365) , seem to have an equally or even higher degree of similarity to the 16S rRNA gene sequence derived from the genome sequence reported here than the previously reported gene sequences of strain 101T (see Figure 1). None of the phylotypes reported from environmental screenings or genomic surveys could be linked to A. mirum with a convincing degree of sequence similarity (maximal observed degree of similarity 92%; status June 2009). 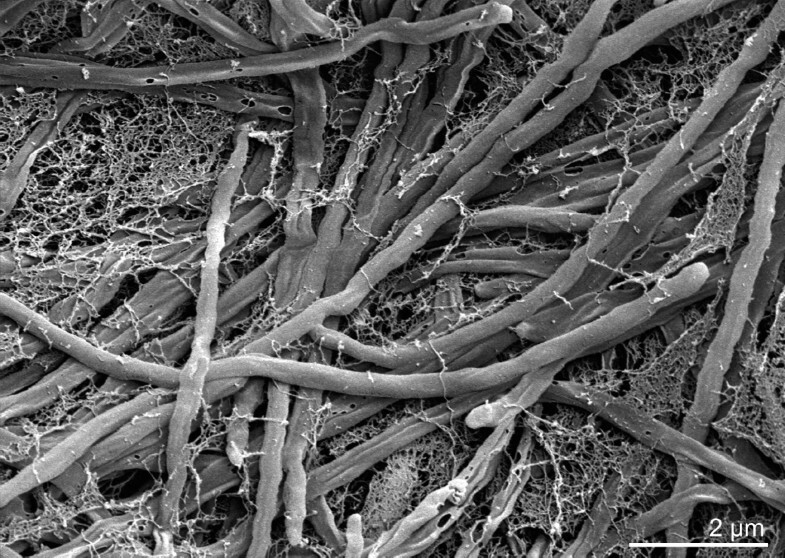 A. mirum strain 101T cells are non-motile with fine hyphae which form aerial and substrate mycelia. Both the aerial and substrate mycelia are about 0.5 to 1.0 µm in diameter. Aerial mycelia are long branching hyphae, white to pale yellow in color (Figure 2). The substrate mycelia are also long, branching hyphae, white to yellowish orange, and penetrate into the agar medium and form synnemata . Cells stain Gram-positive and are non-acid fast . Scanning electron micrograph (SEM) of A. mirum 101T. More SEMs of A. mirum can be found in the Compendium of the Actinobacteria, by Joachim M. Wink, University of Braunschweig. A. mirum is capable of producing a yellowish-brown soluble pigment on tyrosine agar and a pale greenish pigment on oatmeal agar . Capable of hydrolyzing starch, casein, tyrosine and gelatin, but not xanthine, hypoxanthine, adenine and urea ; produces nitrate reductase and phosphatase. Positive for utilization of tartrate, pyruvate, lactate and malate, but negative for benzoate, acetate, citrate and succinate . Acid is produced aerobically from fructose, lactose, maltose, D-mannitol, L-arabinose, D-melibiose, D-mannose, L-rhamnose, xylose, dextrin, galactose, glucose, trehalose, raffinose, starch, sucrose, cellobiose, glycogen and adonitol, but not from inositol, sorbitol, D-ribose, salicin, inulin, glycerol, dulcitol, erythritol, α-methyl-D-glucoside and α-methyl-D-mannoside. A. mirum is a producer of nocardicin antibiotics  and inhibits the growth of several Gram-positive bacteria including: Bacillus megaterium, Sarcina lutea, Mycobacterium smegmatis; as well as the filamentous fungi, Aspergillus niger, Penicillium notatum and the yeasts, Saccharomyces cerevisiae and Candida tropicalis. Figure 1 shows the phylogenetic neighborhood of A. mirum strain 101T in a 16S rRNA based tree. The sequences of the five 16S rRNA genes in the A. mirum genome differ by no more than one nucleotide (nt) from each other, and by up to six nts from the previously reported reference sequences derived from NBRC 14064 (AF328679) and from DSM 43827 (X84447). The differences between the genome data and the previously reported 16S rRNA gene sequence are probably due to sequencing errors in the previously reported sequence data. The peptidoglycan of A. mirum contains meso-diaminopimelic acid in addition to alanine, glutamic acid and glucosamine. Galactose and mannose are present in the cell wall sugars, whereas madurose is absent. Cell wall type III has been detected, as well as whole-cell sugar pattern of type C . The fatty acid pattern of strain 101T is dominated by saturated straight chain acids, C17:0 (15.2%), C16:0 (4.8%), C15:0 (2.6%), and branched chain acids, anteiso-(ai-)C13:0 (11.6%), ai-C15:0 (5.9%), ai-C17:0 (4.5%), ai-C11:0 (2.3%), and iso-(i-)C12:0 (11.3%), i-C16:0 (7.5%), i-C14:0 (3.5%), i-C15:0 (2.1%), i-C11:0 (1.5%). Unsaturated straight chain acids play only a limited role: C17:1 cis9 (11.3%), and C16:1 cis9 (3.4%) are present, whereas unsaturated branched chain fatty acids are absent. Minor amounts of hydroxylated fatty acids were detected: C16:1 2OH (1.0%), ai-C15:0 2OH (0.9%), and C15:0 3OH (0.5%) [Cellular fatty acids data from RM Kroppenstedt, DSMZ, unpublished]. The published literature on the fatty acid patterns is, however, contradictory, with Hasegawa et al. , and Yassin et al . emphasizing the presence of branched chain fatty acids (including a 10-methyl C18:0), but neither unsaturated nor hydroxylated fatty acids are reported. The major polar lipids present are: diphosphatidylglycerol (DPG), phosphatidylethanolamine (PE), phosphatidyl inositol mannosides (PIM) and phosphatidylinositol (PI) . Hydroxy-phosphatidylethanolamine (OH-PE) has been reported by some authors [10,12], but not by others [9,10]. MK-9(H4) and MK-9(H6) are the predominant menaquinones . This organism was selected for sequencing on the basis of its phylogenetic position, and is part of the Genomic Encyclopedia of Bacteria and Archaea project. The genome project is deposited in the Genomes OnLine Database  and the complete genome sequence in GenBank (CP001630). Sequencing, finishing and annotation were performed by the DOE Joint Genome Institute (JGI). A summary of the project information is shown in Table 2. Two genomic libraries: 8kb pMCL200 and fosmid pcc1Fos Sanger libraries. A. mirum strain 101T, DSM 44827, was grown in DSMZmedium535 (GYM Streptomyces Medium at 28°C. DNA was isolated from 1–1.5 g of cell paste using Qiagen Genomic 500 DNA Kit (Qiagen, Hilden, Germany) with a modified lysis buffer (1 ml achromopeptidase and 0.5 ml lysostaphin added) and one hour incubation at 37°C. The genome was sequenced using a combination of Sanger and 454 sequencing platforms. All general aspects of library construction and sequencing performed at the JGI can be found on the JGIwebsite. 454 Pyrosequencing reads were assembled using the Newbler assembler version 1.1.02.15 (Roche). Large Newbler contigs were broken into 10,493 overlapping fragments of 1,000 bp and entered into assembly as pseudo-reads. The sequences were assigned quality scores based on Newbler consensus q-scores with modifications to account for overlap redundancy and to adjust inflated q-scores. A hybrid 454/Sanger assembly was made using the phrap assembler (High Performance Software, LLC). Possible mis-assemblies were corrected with Dupfinisher or transposon bombing of bridging clones . Gaps between contigs were closed by editing in Consed, custom primer walk or PCR amplification. 1,564 Sanger finishing reads were produced to close gaps and to raise the quality of the finished sequence. The error rate of the completed genome sequence is less than 1 in 100,000. Together all sequence types provided 28.9x coverage of the genome. The final assembly contains 105,508 Sanger reads in addition to the 454 based pseudo reads. Genes were identified using Prodigal  as part of the Oak Ridge National Laboratory genome annotation pipeline, followed by a round of manual curation using the JGI GenePRIMP pipeline . The predicted CDSs were translated and used to search the National Center for Biotechnology Information (NCBI) nonredundant database, UniProt, TIGRFam, Pfam, PRIAM, KEGG, COG, and InterPro databases. Additional gene prediction analysis and functional annotation was performed within the IntegratedMicrobialGenomes (IMG-ER) platform . The genome is 8,248,144 bp long and comprises one circular chromosome with a 73.7% GC content (Table 3 and Figure 3). Of the 7,174 genes predicted, 7100 were protein coding genes, and 74 RNAs., One hundred and eight four pseudogenes were also identified. The majority of genes (67.3%) of the genes were assigned a putative function while the remaining ones were annotated as hypothetical proteins. The prop-erties and the statistics of the genome are summarized in Table 3. The distribution of genes into COGs functional categories is presented in Table 4. We gratefully acknowledge the help of Marlen Jando for growing A. mirum cultures and Susanne Schneider for DNA extraction and quality analysis (both at DSMZ). This work was performed under the auspices of the US Department of Energy’s Office of Science, Biological and Environmental Research Program, and by the University of California, Lawrence Berkeley National Laboratory under contract No. DE-AC02-05CH11231, Lawrence Livermore National Laboratory under Contract No. DE-AC52-07NA27344, and Los Alamos National Laboratory under contract No. DE-AC02-06NA25396, as well as German Research Foundation (DFG) INST 599/1-1.